Thank you to Dr. Jamie D. Aten, Founder and Co-Director of the Humanitarian Disaster Institute at Wheaton College in Wheaton, Illinois for the following guest post. There was a lot of fanfare leading up to Stephen Colbert’s September debut on the Late Show. However, it seems like a whole lot less people were aware of another important September debut—National Preparedness Month. In celebration of Colbert’s new show, I wanted to share a several important elements of disaster preparedness—each inspired by segments of Colbert’s last gig, The Colbert Report. Threat Down: Conduct a Risk Assessment. According to Colbert, bears are our country’s biggest threat. If you’ve seen this segment of his old show then you know he normally included a couple other major threats, like penguins, for safe measure. He was looking out for us by alerting viewers to the dangers that are out there. While Colbert’s list is entertaining, what he suggests is a vital part of preparedness—everyone does need to know the most likely threats to affect their communities. It is important to know what types of disasters have affected your community in the past, big and small. It is also a good idea to consider what types of disasters are most likely to occur in the future. Perhaps your community has a history of floods or of forest fires. Or maybe you live in an area prone to tornadoes or hurricanes. Whatever the threats, the more aware of them you are, the more likely you can prepare for them. Doomsday Bunkers: Gather Supplies. A few years ago Colbert reported on family heirloom quality doomsday bunkers. My guess is that most of you reading this probably don’t have funds handy to purchase one of the bunkers he referred to as “underground cruise ships.” You know, the real nice kind of doomsday bunker you can pass along from generation to generation. The good news is that you don’t have to be able to afford a bunker to prepare for the worst. However, if you can afford it, you should try to set aside enough non-perishable food and water for about 72 hours. You’ll also want to make sure you have a small backup supply of any medicines you or your family might need. Some other basics to have on hand might include a first aid kit, batteries, flashlights, and a weather radio. If you have small children, you’ll also want to pack some toys and other comforts to help them through the process. Americans for a Better Tomorrow, Tomorrow: Give. In 2011 Colbert launched his own Colbert Super PAC and invited members of Colbert Nation to give to his cause. Thanks to the generosity of his viewers and some of his friends, he was able to raise over a million dollars in funding. Upon the closing of his Super PAC, Colbert shared that he wanted the remaining monies to go to UNICEF. He went on to add, “Unfortunately, the rest of the board found out that UNICEF is the name of my yacht.” Colbert then announced that instead of funding his yacht, a significant portion of the funds would go to help Superstorm Sandy relief efforts. Like Colbert, we need to do our part to help others affected by disasters. Even if we don’t have our own Super PAC, we can give what we can. After major disasters and crises, Colbert regularly highlights non-profit groups like Red Cross where viewers can text a small donation. If funds are tight, consider other options like volunteering at a shelter or food bank. Maybe the most important lesson we can learn about preparedness doesn’t actually come from his shows, but from Stephen Colbert himself. In recent years, Colbert has shared openly about some of the hardships he and his family faced growing up. These included experiences of incredible loss. Rather than becoming bitter due to hardships, he learned and grew from these experiences. He found ways to be grateful amid adversity—he learned how to be resilient. Granted The Colbert Show and the Late Show aren’t the best places to go for disaster preparedness lessons. However, if we look at the person behind the shows, it’s probably more likely we’ll learn a thing or two. 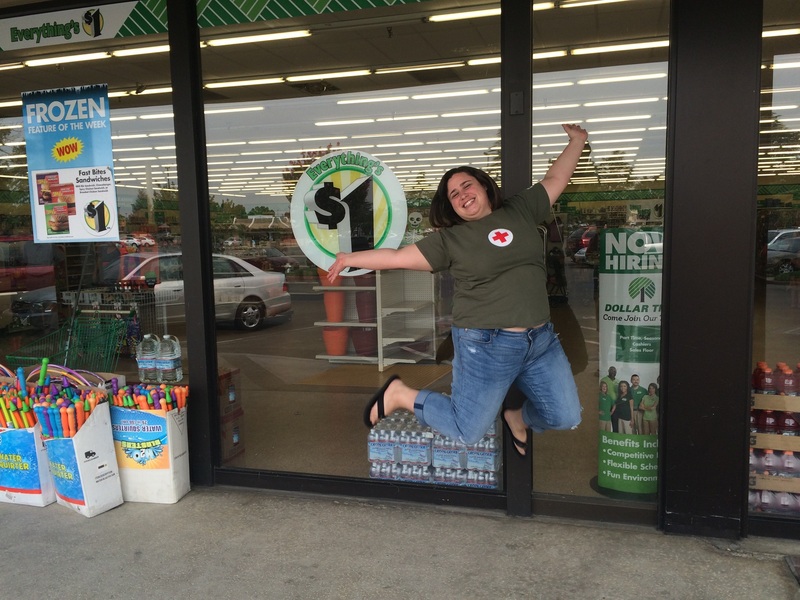 Disaster On A Dollar: The Dollar Store Emergency Kit Challenge! Red Crossers here at home and around the nation have been responding to violent flooding, fires, and other natural disasters all Summer long. In our Central California Region alone, we’ve responded to nearly a dozen wildfires in the last three weeks. If you live in the heart of a major city, you may never experience a wildfire evacuation. But you may not realize that your local Red Cross responds to hundreds of home fires every year. And with with thousands of acres burned due to wildfires, flash floods and landslides are still a real threat to many homes this winter. It’s important for every family, no matter where you live, to have an emergency kit ready to go. 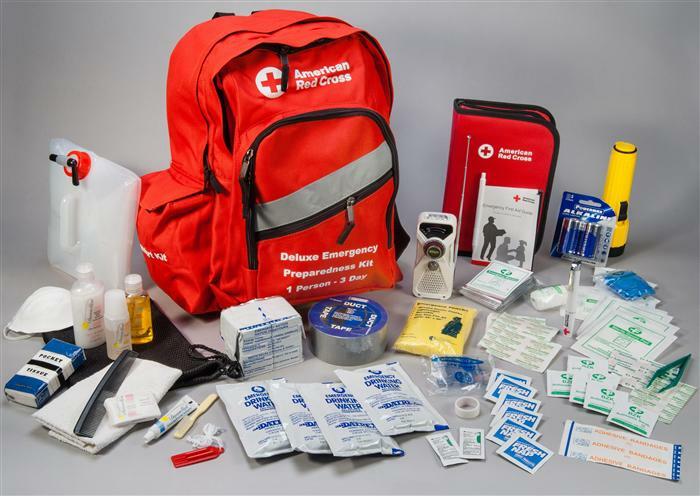 But emergency kits can be expensive, sometimes costing hundreds of dollars. That’s why I challenged myself to put together a basic emergency kit on a budget of just $30. It’s something I like to call… Disaster on a Dollar! And where would I go to find all the best supplies for my budget kit? Why, the dollar store, of course! You’d be surprised what kind of great stuff you can find at the dollar store! Our first stop was the party aisle. Yes, you read that right! Glow sticks aren’t just for dance parties anymore. We grabbed some to use for emergency lighting when the power goes out. We also picked up a set of plastic silverware for eating our emergency food supply. Next stop was the hardware aisle. This is the emergency kit JACKPOT! We managed to find flashlights, lighters, plastic sheeting, duct tape, scissors, and more. I’m sure the cashier thought she was in an episode of Dexter. Next up, hygiene. Make sure your kit has all the basics: soap, toothbrush, first aid supplies, and other toiletries. Again, the dollar store met almost all of our needs! This is the face of a Red Cross spouse who gets dragged along on preparedness adventures. 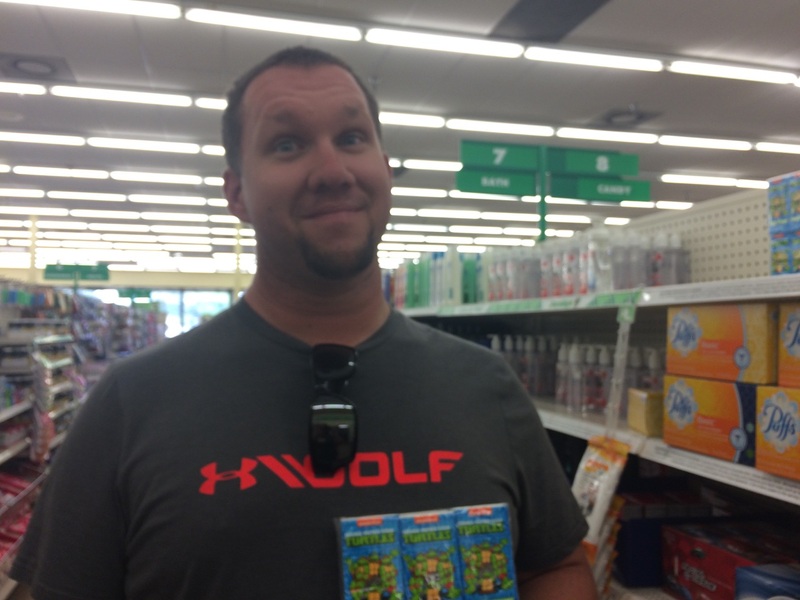 Ben said we should get some Teenage Mutant Ninja Turtle tissues. I agreed. Cowabunga, dude! Next we had to look at some special considerations. If you have pets, small children, or specific medical needs, make sure you include supplies for those as well. We have a dog and two cats, so we grabbed some supplies for them, like an extra leash and food. We made a few final stops in the grocery section to pick up some food and water. Then it was time to check out. We had a pretty good haul! It was the moment of truth – did we stay under our budget? You don’t have to purchase these items all at once. Try picking up just one extra item every time you go to the store and in just a few weeks, you could have everything you need for a disaster. So don’t let the expense of a fancy emergency kit scare you away from being prepared for an emergency. Click here for more ideas on putting together your own emergency kit.